As New Music Buff heads on into its fourth year in the online realm I find that I have a steadily increasing readership averaging 18 hits per day with an international reach of about 88 countries. I say readers, not followers because the stats provided have no way to track returning visitors but you know who you are. And I thank WordPress for their entertaining summary published earlier here. This is a 2013 article which continues to be popular. I did an addendum called: Black Conductors, A Belated Addendum and received a note from Tania Leon who remarked quite correctly that she is indeed a black American conductor. Clearly I will need to expand this survey once again. 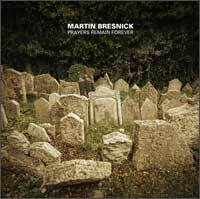 This review of the excellent newly released Martin Bresnick CD went the equivalent of viral for my blog and I was pleased to have discovered the work of this wonderful American composer. This relatively little known living black American composer was a child prodigy whose second symphony was commissioned by Quincy Jones had his sixth symphony premiered in Moldova in 2014. I was granted a comp ticket to see this really great performance of a little known 20th century opera by a black female American composer, Zenobia Powell Perry. It was a great experience, a passionate, entertaining performance and put Modesto on the musical map for me. Curiously this review was read more than the one about the 2014 Other Minds 19. More to come about the upcoming Other Minds 20. For anyone who doesn’t know this is my favorite new music festival. This article about a 2013 performance by this very talented multi-instrumentalist, singer and scholar/historian continues to be popular. I’m hoping to catch another of his performances in 2015. I started in 2013 writing an occasional series of articles for Black History Month. I had no idea how popular this would become. The theme for the 2014 series is given in the title and you can rest assured that I will continue the series in 2015. A review of a crowd sourced recording project and one of my favorites of 2014. This is the introductory article for the 2014 series. Many thanks for the comments and support on this article and its successors. I plan to give my summation of the various responses on this received both on and off the books. This is one of an ongoing series of articles on political expression in music. It was after I friended Dorothy Martirano on Facebook and mentioned this piece that the article got a few new readers. Perhaps I should have mentioned the composer in my title. Kudos to the late great Salvatore Martirano, gone too soon and too little known even now some twenty years after his passing. I promise a more comprehensive review soon but this is a great CD by a too little known American composer. 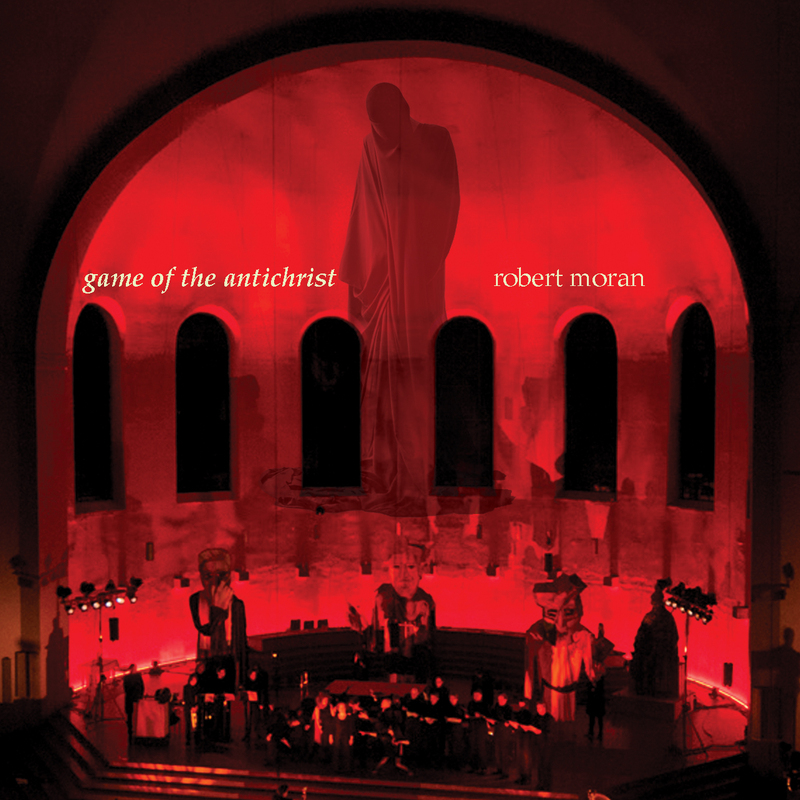 Mr. Moran recommended the disc to me after I wrote to him praising his wonderful “Trinity Requiem”. I plan a more comprehensive article soon. Meanwhile here is a link to a performance on Vimeo. 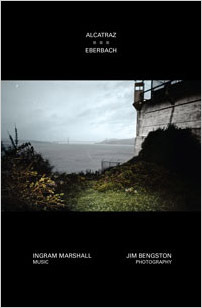 This DVD is essentially the completion of a collaboration of photographer Jim Bengston and composer Ingram Marshall. As such it is the most complete artistic statement superseding the audio only release (still worth having by the way) from some years ago. 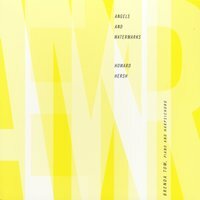 A difficult to categorize recording that brings two major works by this (previously unknown to me) Canadian composer to the listening audience. I reviewed this disc here. I am still working on absorbing its subtleties. In addition to providing me with quite a few readers the opportunity to review this recording introduced me to the work of this too little known living American composer. My review garnered quite an amazing amount of readers as well as an appreciative response from Mr. Bresnick himself. And now I find myself buying his other recordings. Really great music. 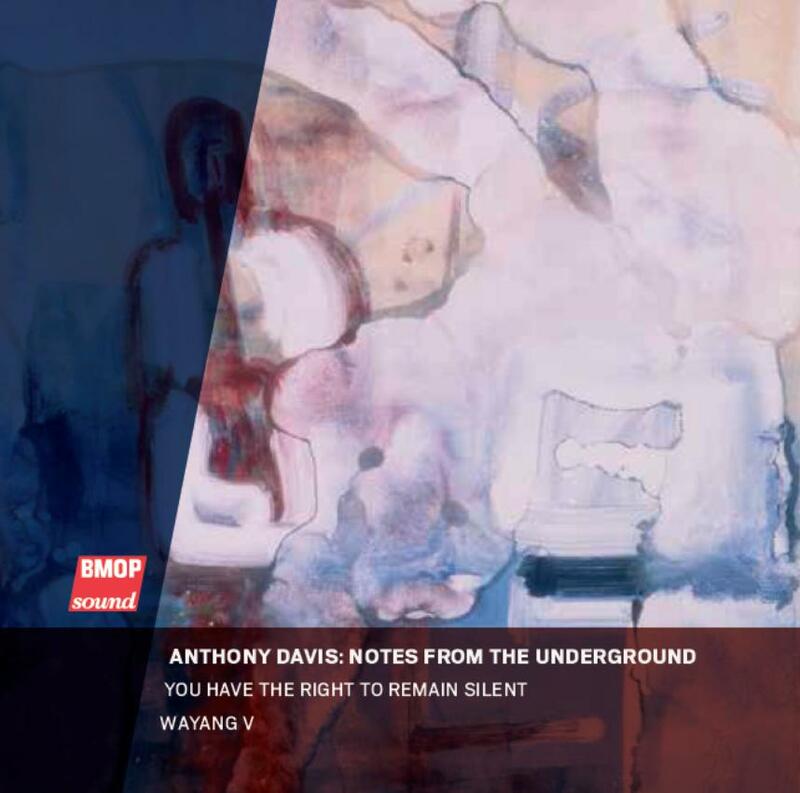 I have been a fan on Anthony Davis and his music for some years now and I was pleased to be able to review this disc. 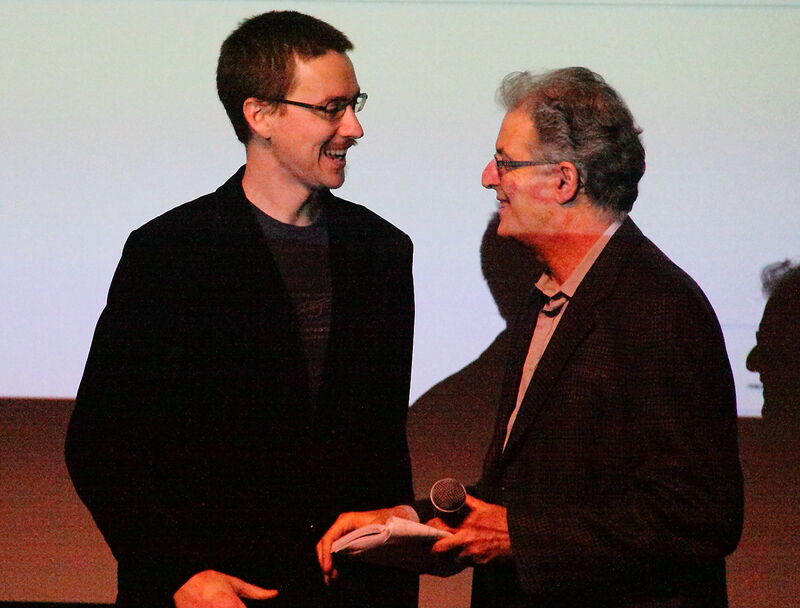 I was later able to obtain an interview with Professor Davis which will be forthcoming later this year. 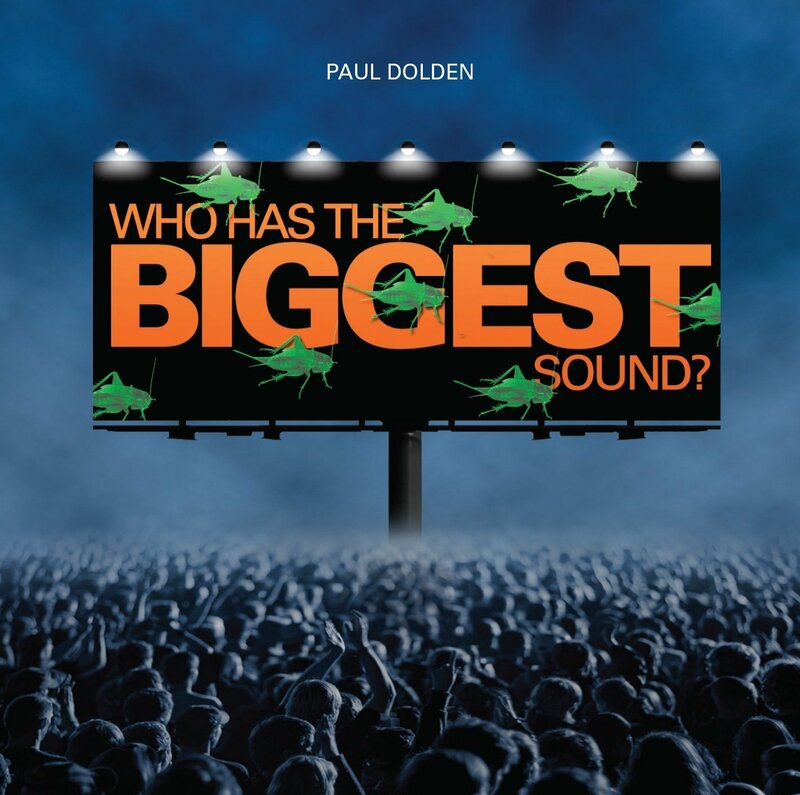 I eagerly reviewed this crowd sourced CD in which I was proud to be one of the contributors to its production. It is only the second recording of Johnson’s landmark of minimalism and an opportunity to hear the work of the fine composer/performer Samuel Vriezen. This Labor Records release would have escaped my attention were it not for my having run across it while researching another new music article. New music aficionados might remember Eric Salzman for earlier works such as “Civilization and It’s Discontents” and his involvement with Nonesuch records or one of his many other significant involvements in the new music scene over the last 40 years or so. 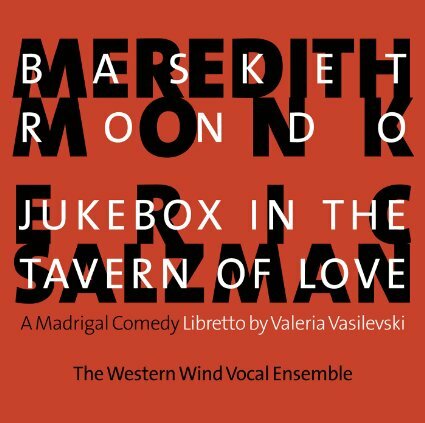 This disc is the première recording of Meredith Monk’s “Basket Rondo”, one of her best realized new works as well as the première of a great new sound/music drama by Salzman. A more thorough review is in the works. Mr. Hersh kindly sent me this CD for review which will be forthcoming but it easily makes it to my favorites list for 2014. 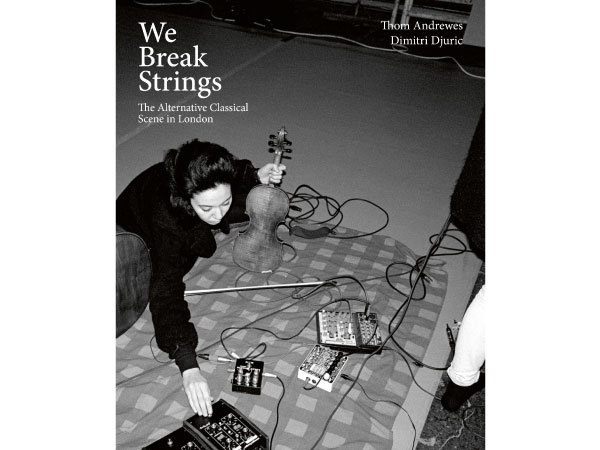 I also have to mention another crowd sourced project, “We Break Strings” by Thom Andrews and Dimitri Djuric, a book about the “alternative classical scene in London”. The book which includes a CD sampler languishes in my “to be read” stack but my initial perusal left me with the impression of a beautifully conceived and executed volume which has much to offer the musically curious. More about this book in a future blog. 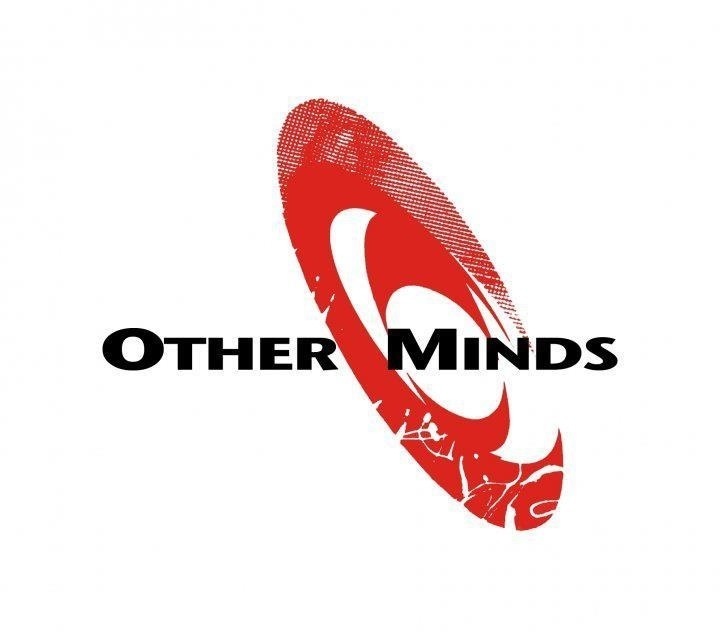 OM 18 has been my fifth experience at the Other Minds festival. The most amazing thing about Other Minds is their ability to find new music by casting a wide net in the search for new, unusual and always interesting music. As I said in my preview blog for these concerts this year’s selection of composers was largely unfamiliar to me. Now I am no expert but my own listening interests casts a pretty wide net. Well this year I had the pleasure of being introduced to many of these composers and performers with no introduction save for the little research I did just before writing the preview blog (part of my motivation for doing the preview blog was to learn something about what I was soon to hear). The first night of the series consisted of what is generally classified as “folk” or “traditional” music. Not surprisingly these terms fail to describe what the audience heard on Thursday night. First up was the Danish folk trio ‘Gáman’ consisting of violin, accordion and recorder. This is not a typical folk trio but rather one which uses the creative forces of three virtuosic musicians arranging traditional musics for this unusual ensemble. On recorder was Bolette Roed who played various sizes of recorders from sopranino to bass recorder. Andreas Borregaard played accordion. And Rune Tonsgaard Sørensen was on violin. The first piece, ‘Brestiskvædi’ was their rendering of this traditional song from the Faroe Islands (a group of islands which is under the general administration of Denmark but which has its own identity and a significant degree of independence). It struck my ears as similar in sound to the music of Scotland and Ireland, lilting beautiful melodies with a curiously nostalgic quality. Next was a piece by Faroese composer Sunleif Rasmussen. It was the U.S. premiere of his ‘Accvire’ from 2008, a name derived from the two first letters of the instruments for which it was written (as we learned in the always interesting pre-concert panel). It was commissioned by this ensemble. 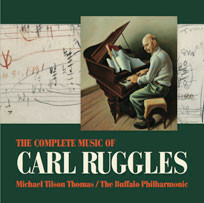 The work reflected the composer’s facility with instrumentation and retained some suggestion of folk roots as well. It employed a rich harmonic language within a tonal framework in what sounded almost like a post-minimalist piece. The trio met the challenges of the music and delivered a lucid reading of this music which seemed to satisfy both the musicians and the audience. The trio followed this with three more folk arrangements, two more from the Faroe Islands and one from Denmark. Like the first piece they played these had a similar ambience of calm nostalgia. 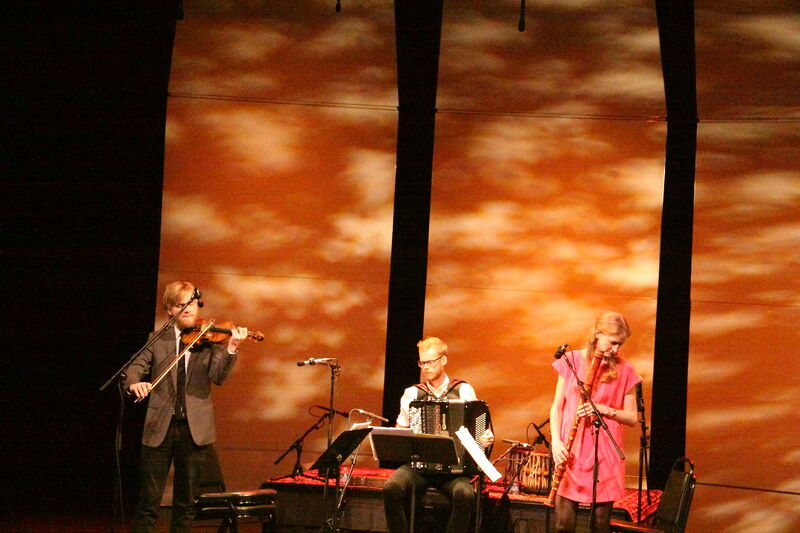 The Danish folk piece set the stage for the next work, a world premiere by one of Denmark’s best known living composers, Pelle Gudmunsen-Holmgreen. The piece ‘Together or Not’ from 2013 is an Other Minds commission. The composer, who was not present, wrote to Other Minds director Charles Amirkhanian saying, “the title is the program note”. While the statement was rather cryptic the music was not. This was less overtly tonal than the Rasmussen work and was filled with extended instrumental techniques and good humor. Again the instrumentalists demonstrated a comfortable facility with the technical challenges of the music and delivered a fine reading of this entertaining piece. The nicely framed program continued with two traditional drum songs from Greenland (the violinist, holding his instrument rather like a guitar produced a sort of modified pizzicato technique which played the drum part). These haunting melodies seemed to evoke the desolate landscape of their origin. The program ended with a Swedish polka and, in response to a very appreciative audience, an encore of another spirited polka. These were upbeat dance music that all but got the audience up and dancing. The audience seemed uplifted by their positive energy. G.S. Sachdev (left) and Swapan Chaudhuri. 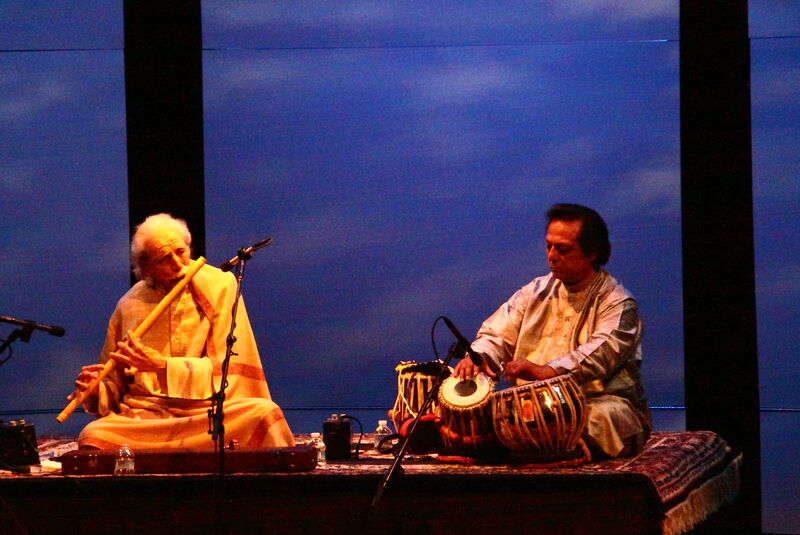 The second half of the first night’s concert consisted of two traditional Hindustani Ragas. These pieces are structured in aspects of the the music but allow for a great deal of repetition and improvisation in which the musicians bring the music to life. Hindustani music is deeply rooted in culture and spirituality. The ragas are associated with yogic chakras, moods and time of day. Their performance is intended to enhance the audience esthetically and spiritually. G.S. Sachdev is a bansuri player. The bansuri is a wooden flute common in this type of music (though Sachdev’s level of mastery is hardly common). He was accompanied by the familiar tanpura drone produced by digital drone boxes instead of the actual instruments which produce the familiar drone sound that underlies Hindustani music performances. Swapan Chaudhuri played tabla. It is difficult to see the tabla as an “accompanying” instrument as much as it is a complementary instruments especially when played by a master such as he. Chaudhuri is the head of the percussion department at the Ali Akbar Khan school in San Rafael in the north bay. Sachdev has also taught there. Both men have ties to the bay area. The musicians performed Raga Shyam Kalyaan followed by Raga Bahar. Originally I had thought of trying to describe these ragas in their technical aspects but my knowledge of Hindustani music cannot do justice to such an analysis. Rather I will focus on the performances. Raga Shyam Kalyaan was first and received an extended reading. How long? Well I’m not sure but this music does create a sort of suspended sense of timelessness when performed well. Indeed that was the effect on this listener. The whole performance of both ragas could not have exceeded one hour but the performances by these master musicians achieved the height of their art in producing riveting performances of this beautiful music. Sachdev’s mastery certainly has virtuosity but his genius lies in being able to infuse his performance with spirituality from within himself and to impart that spiritual resonance to his audience. He was ably aided in that endeavor by Chaudhuri who, clearly a master of his instrument and connected with Sachdev, channeled his connection with the infinite. The audience responded with great warmth and appreciation concluding the first day of the festival. 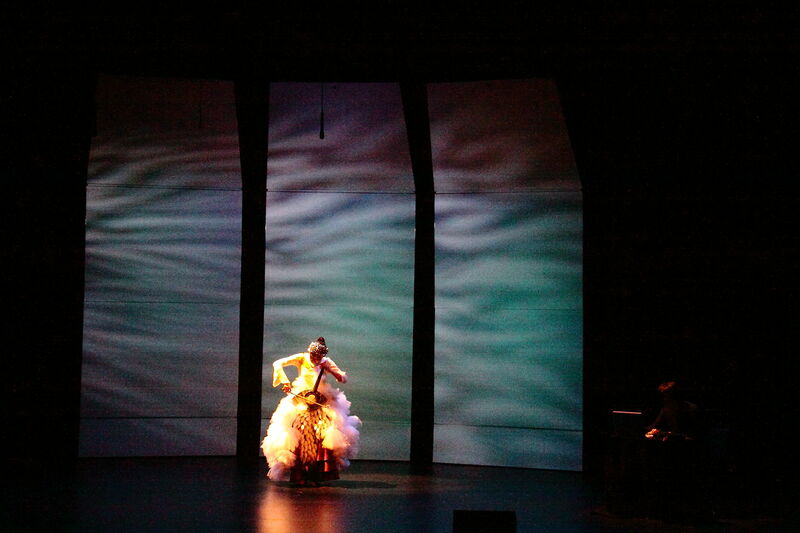 Composer, performer, designer, shaman Dohee Lee performing her work, ‘ARA’. Friday night began with the world premiere of the music theater performance piece, ‘ARA’ by Korean-American artist Dohee Lee. Continuing with the spiritual tone set by yesterday’s Raga performances Lee introduced her multi-disciplinary art derived from her study of Korean music, dance and shamanism as well as costume design and music performance. She was aided in her efforts by the unique instrument designed for her by sculptor and multi-disciplinary artist Colin Ernst. The Eye Harp (seen in the above photo) is an instrument that is played by bowing and plucking strings and is connected to electronics as well. The art of lighting designer David Robertson, whose work subtly enhanced all the performances, was clearly in evidence here. This was a feast for the eyes, ears and souls. 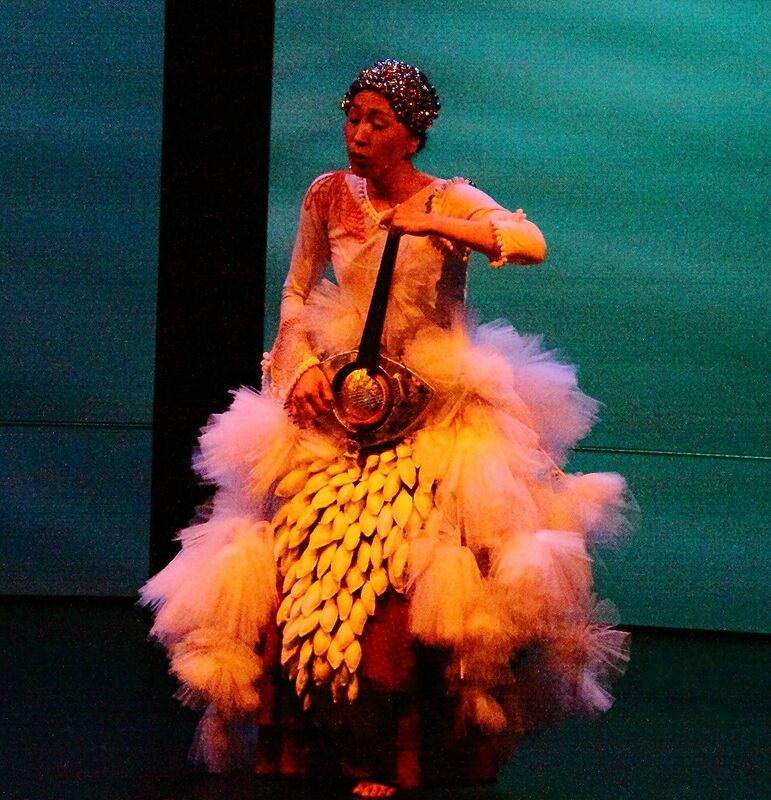 Dohee Lee’s creative costume design was integrated with the visually striking Eye Harp instrument. And the music with sound design processing her instrument nicely complimented her vocalizations. All were lit so as to enhance the visual design and create a unified whole of this performance. Dohee Lee on the carefully lit stage off Kanbar Hall. Her performance began slowly with Lee in her beautiful costume took on the role of a modern shaman conjuring glossolalia in shamanic trance along with choreographed movement and accompanied by her Eye Harp and electronic sounds through the theater’s great sound system. Like the raga performances of the previous night I wasn’t aware of how long this timeless performance lasted (the program said it was 10 minutes) . But I wished it would have gone on longer. Even with photographs the experience here is difficult to articulate. 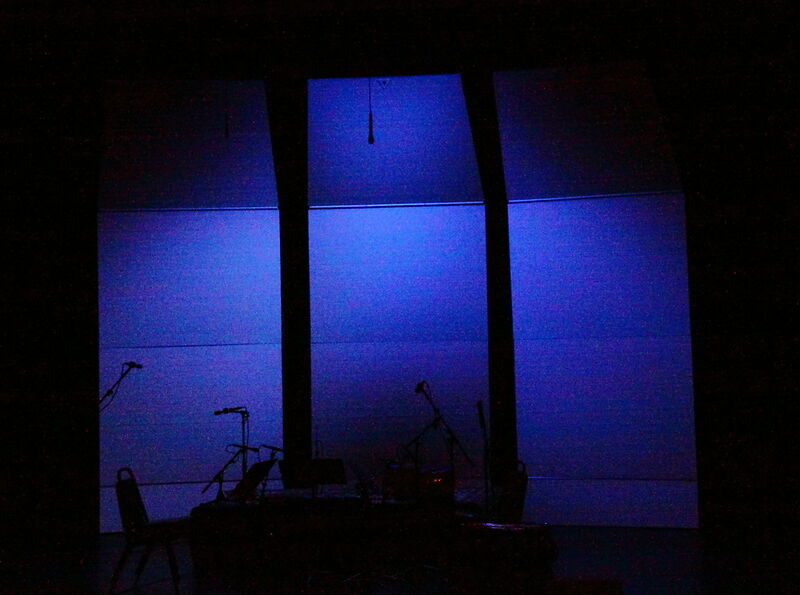 The sound enveloped the audience who viewed the carefully lit stage in the otherwise darkened hall as the sounds communicated a connection with the sacred. I am still trying to digest what I saw and heard on this Friday night. I don’t know how most of the audience experienced this piece but they seemed to have connected with it and responded with grateful applause. She seemed to connect as both artist and shaman. 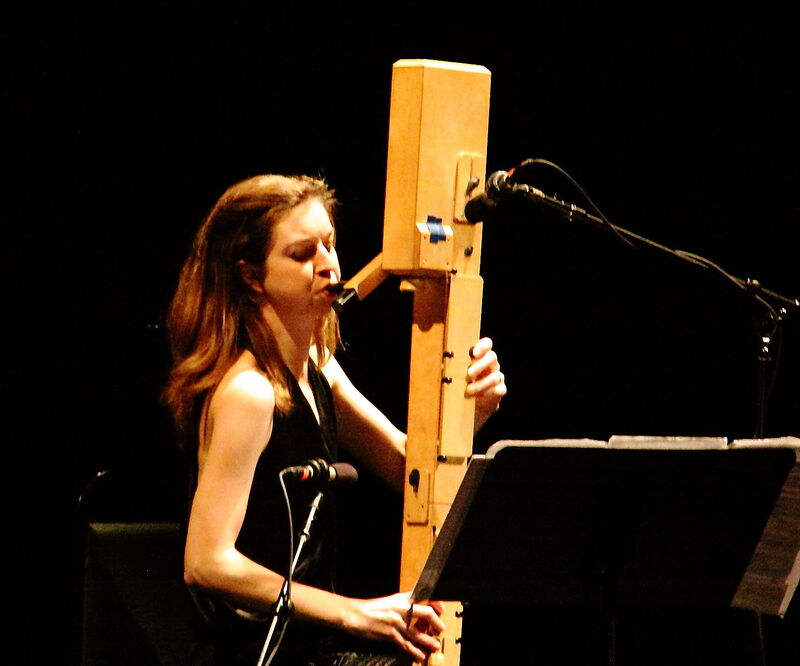 Anna Petrini performing with her Paetzold contrabass recorder. Following Dohee Lee were three pieces for an instrument called the Paetzold contrabass recorder (two before intermission and one after). Paetzold is the manufacturer who specializes in the manufacture of recorders, forerunner of the modern flute. The square contrabass recorder is a modern design of this woodwind instrument. However, knowing the sound of the recorder in music of Bach and his contemporaries, gives the listener no useful clues as to what to expect from the unusual looking instrument pictured above. 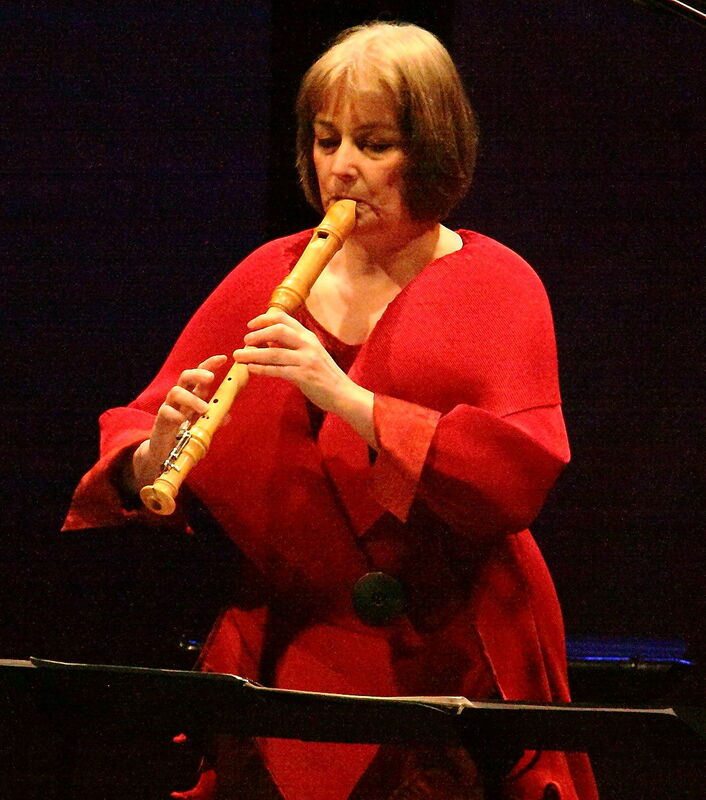 Anna Petrini is a Swedish recorder virtuoso who specializes in baroque and modern music written for the recorder. At this performance she played her contrabass instrument augmented variously by modifications, additions of microphones, little speakers and electronic processing. These pieces were perhaps the most avant-garde and the most abstract music in this festival. 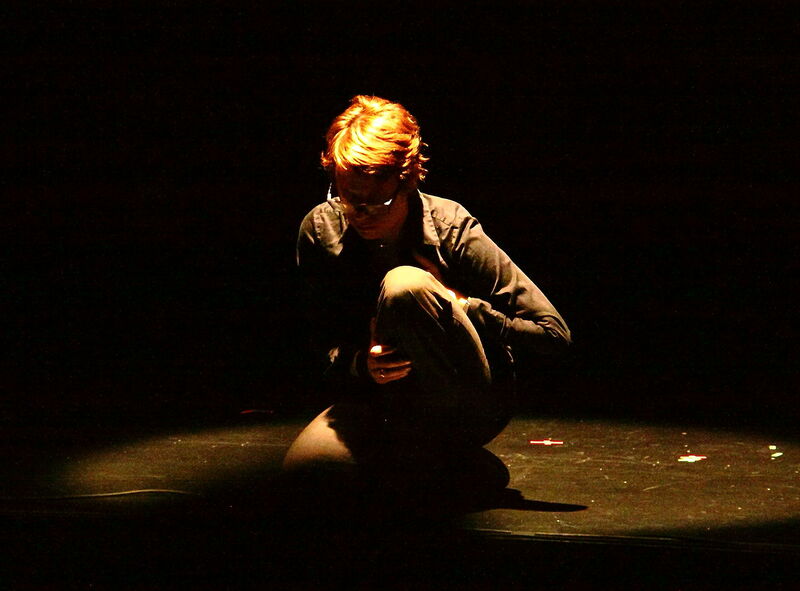 Anna Petrini performing on the stage of Kanbar Hall at the Other Minds festival. The creative stage lighting provided a useful visual counterpoint to the music. The first piece, ‘Split Rudder’ (2011) by fellow Swede Malin Bang was here given it’s U.S. premiere. This piece is concerned with the sounds made inside the instrument captured by small microphones inserted into the instrument. The resulting sounds were unlike any recorder sound that this listener has heard. The piece created percussive sounds and wind sounds. The next piece, ‘Seascape’ (1994) by the late Italian composer Fausto Rominelli (1963-2004) used amplification but no electronic processing. These abstract works were received well by the audience. ‘SinewOod’ (2008) by Mattias Petersson involved introducing sound into the body of the instrument as well as miking it internally and setting up electronic processing with which the performer interacts. Like the two pieces that preceded it this was a complex exercise in the interaction between music and technology which is to my ears more opaque and requires repeated listenings to fully appreciate. The second concert was brought to its conclusion by the young jazz pianist and ECM recording artist Craig Taborn. Detroit born, Taborn came under the influence of Roscoe Mitchell (of AACM fame) and began developing his unique style. Here the term jazz does little to describe what the audience was about to hear. 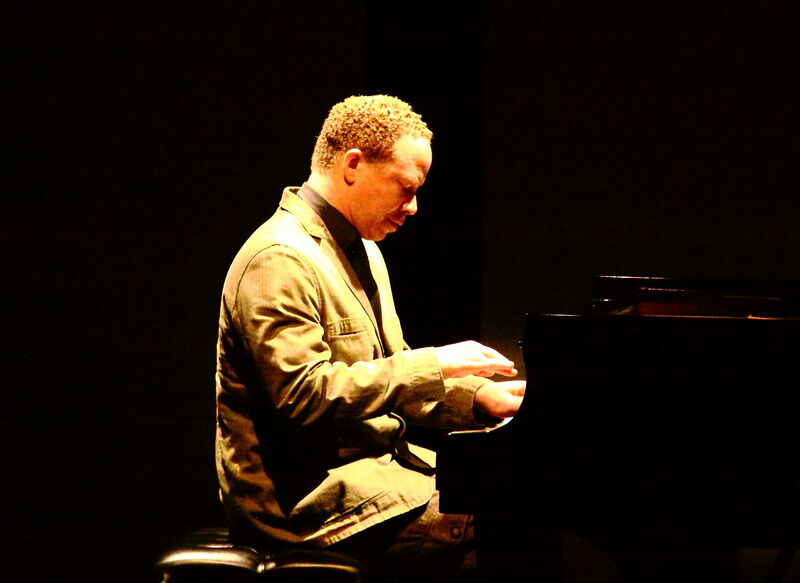 Taborn sat at the keyboard with a look of intense concentration and began slowly playing rather sparse and disconnected sounding notes. Gradually his playing became more complex. I listened searching for a context to help me understand what he was doing. Am I hearing influences of Cecil Taylor? Thelonius Monk? Keith Jarrett maybe? Well comparisons have their limits. As Taborn played on his music became more complex and incredibly virtuosic. He demonstrated a highly acute sense of dynamics and used this to add to his style of playing. I was unprepared for the density and power of this music. Despite the complexity it never became muddy. All the lines were distinct and clear. And despite his powerful and sustained hammering at that keyboard the piano sustained no damage. But the audience clearly picked up on the raw energy of the performance. This is very difficult music to describe except to say that it had power and presence and the performer is a creative virtuoso whose work I intend to follow. Amy X Neuberg along with the William Winant percussion group playing Aaron Gervais. The final concert on Saturday began with the world premiere of another Other Minds commissioned work, ‘Work Around the World’ (2012) for live voice with looping electronics and percussion ensemble. This, we learned in the pre-concert panel is another iteration in a series of language based works, this one featuring the word ‘work’ in 12 different languages. Amy X Neuberg singing at the premiere of Aaron Gervais’ ‘Work Around the World’. 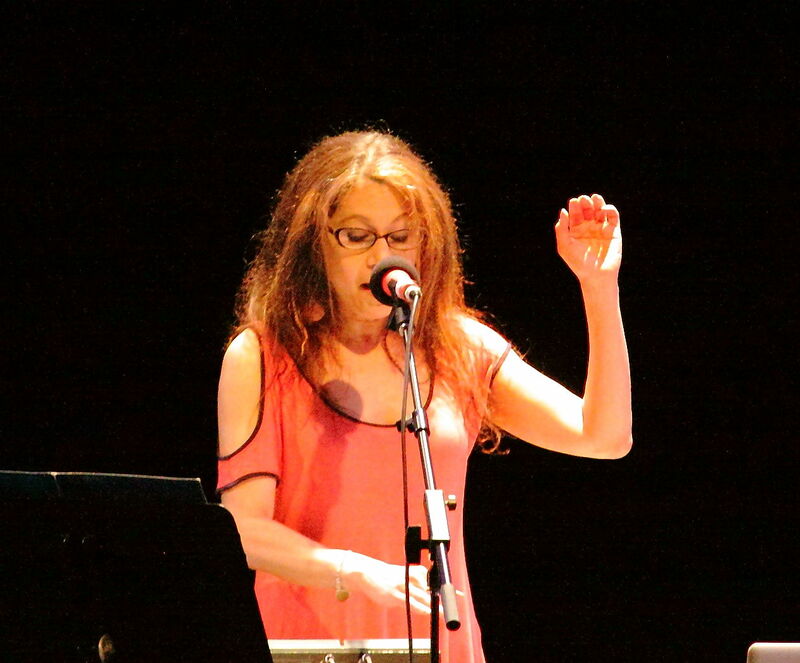 Language is an essential part of the work of local vocal/techno diva Amy X Neuberg’s compositions and performance work. With her live looping electronics she was one instrument, if you will, in the orchestra of this rhythmically complex work. William Winant presided over the complexity leading all successfully in the performance which the musicians appeared to enjoy. The audience was also apparently pleased with the great musicianship and the novelty of the work. Its complexities would no doubt reveal more on repeated listenings but the piece definitely spoke to the audience which seemed to have absorbed some of the incredible energy of the performance. Michala Petri performing Sunleif Rasmussen’s ‘Vogelstimmung’. Back to the recorder again but this time to the more familiar instrument if not to more familiar repertoire. Recorder virtuoso Michala Petri whose work was first made known to the record buying public some years ago is familiar to most (this writer as well) for her fine performances of the baroque repertoire. Tonight she shared her passion for contemporary music. First she played Sunleif Rasmussen’s ‘Vogelstimmung’ (2011) which he wrote for her. It was the U.S. premiere of this solo recorder piece. Vogelstimmung is inspired by pictures of birds and is a technically challenging piece that Petri performed with confidence. At 17 minutes it was virtually a solo concerto. And then back to electronics, this time with Paula Matthusen who now teaches at Wesleyan holding the position once held by the now emeritus professor Alvin Lucier. 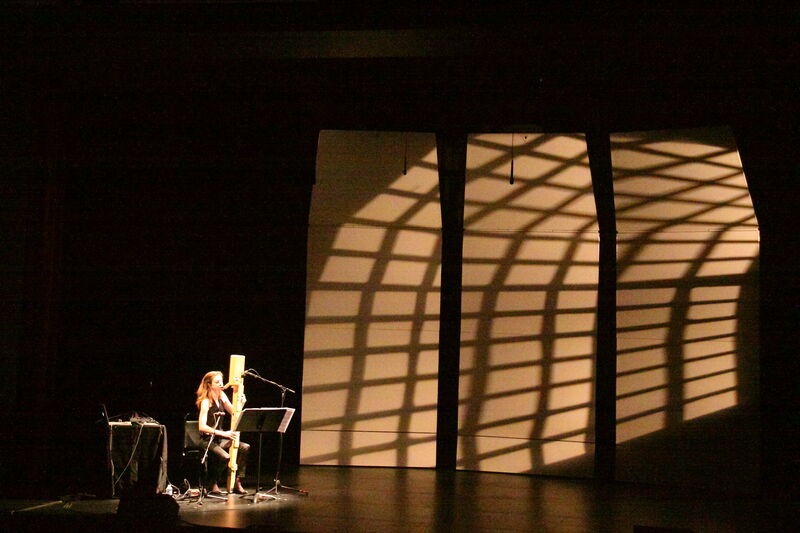 Her piece for recorder and electronics, ‘sparrows in supermarkets’ (2011) was performed by Ms. Petri with Ms. Matthusen on live electronic processing. This was a multi-channel work with speakers surrounding the audience immersing all in a complex but not unfriendly soundfield. Some technical difficulties plagued the beginning of the first piece after intermission so the always resourceful emcee, Other Minds executive director Charles Amirkhanian took the opportunity to introduce the new Operations Director Michael Straus. Straus replaces Adam Fong who has gone on to head a new music center elsewhere in San Francisco. Mr. Amirkhanian also spoke of big plans in the works for the 20th Other Minds concert scheduled for 2015 which will reportedly bring back some of the previous composers in celebration of 20 years of this cutting edge festival. No doubt Mr. Straus has his work cut out for him in the coming months. With the difficulties sufficiently resolved it was time to see and hear Mattias Petersson’s ‘Ström’ (2011) for live electronics and interactive video in its U.S. premiere. 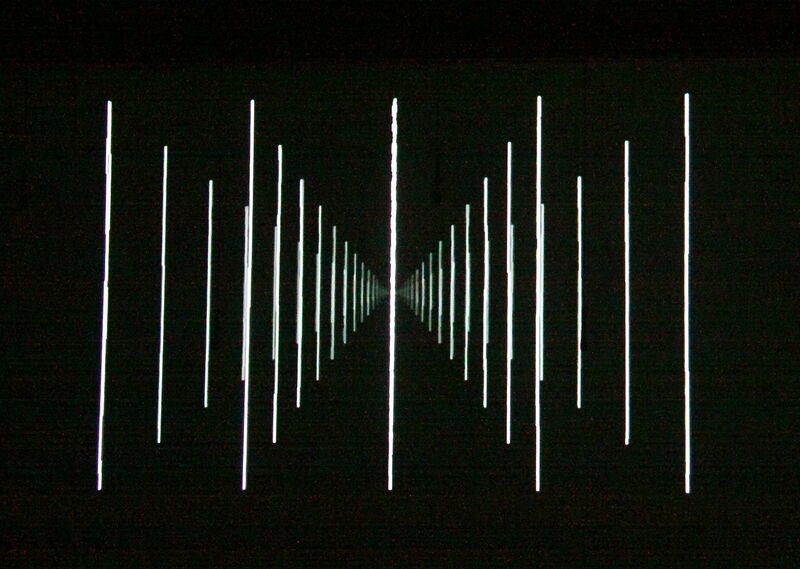 Petersson collaborated with video artist Frederik Olofsson to produce this work in which the video responds to the 5 channels of electronics which are manipulated live by the composer and the five lines on the video respond to the sounds made. The hall was darkened so that just about all the audience could see was the large projected video screen whilst surrounded by the electronic sounds. The work started at first with silence, then a few scratching sounds, clicks and pops. By the end the sound was loud and driving and all-encompassing. It ended rather abruptly. The audience which was no doubt skeptical at the beginning warmed to the piece and gave an appreciative round of applause. Next up, again in a darkened hall was a piece for solo performer and electronics. Composer Paula Matthusen came out on stage and assumed the posture in the above photograph all the while holding a stethoscope to her heart. The details of this work were not given in the program but this appears to be related to the work of Alvin Lucier and his biofeedback work on the 1970s. Again the sounds surrounded the audience as the lonely crouching figure remained apparently motionless on stage providing a curious visual to accompany the again complex but not unfriendly sounds. Again the audience was appreciative of this rather meditative piece. 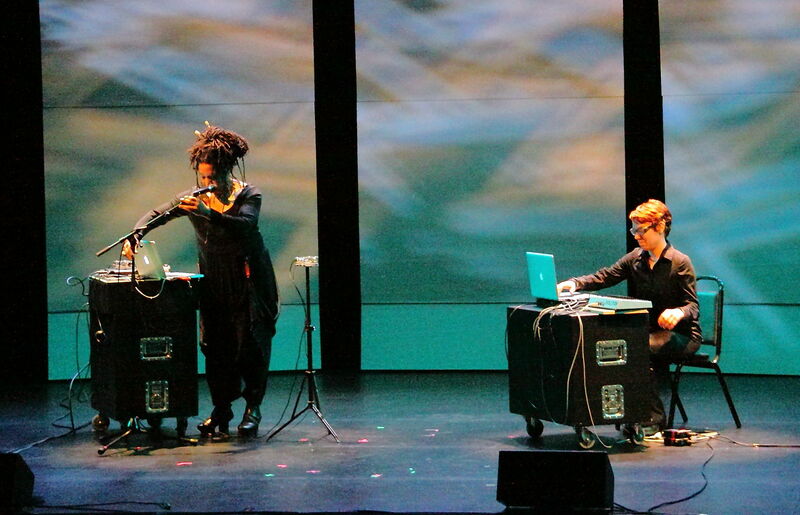 Following that Ms. Mathussen joined another bay area singer and electronics diva, Pamela Z for a joint improvisation. Ms. Z, using her proximity triggered devices and a computer looped her voice creating familiar sounds for those who know her work while the diminutive academic sat at her desk stage right manipulating her electronics. It was an interesting collaboration which the musicians seemed to enjoy and which the audience also clearly appreciated. 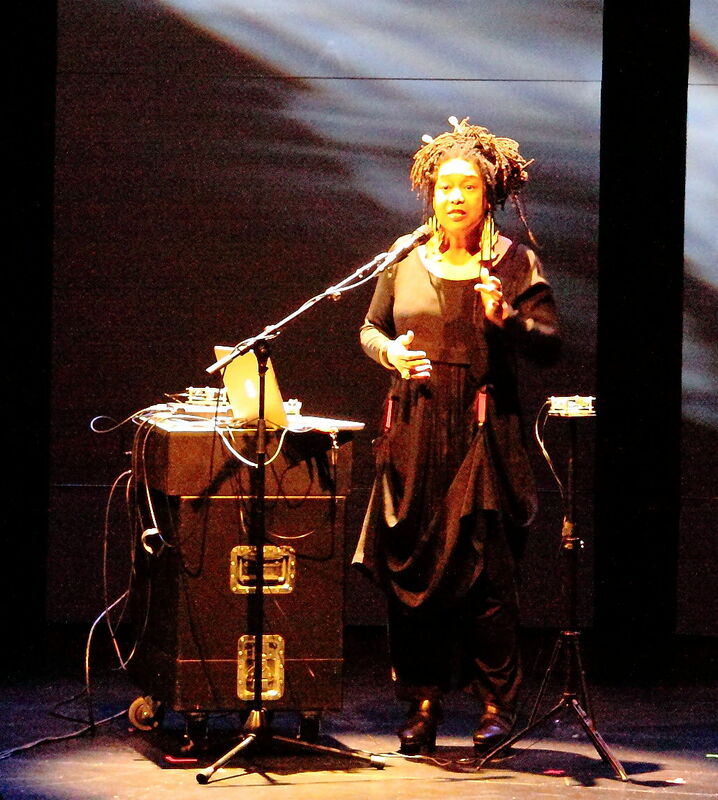 For the finale Pamela Z performed her 2009 arrangement of Meredith Monk’s ‘Scared Song’ 1986) which appeared on a crowd sourced CD curated by another Other Minds alum, DJ Spooky. Z effectively imitated Monks complex vocalizations and multi-tracked her voice as accompaniment providing a fitting tribute to yet another vocal diva and Other Minds alumnus. The audience showed their appreciation with long and sustained applause. 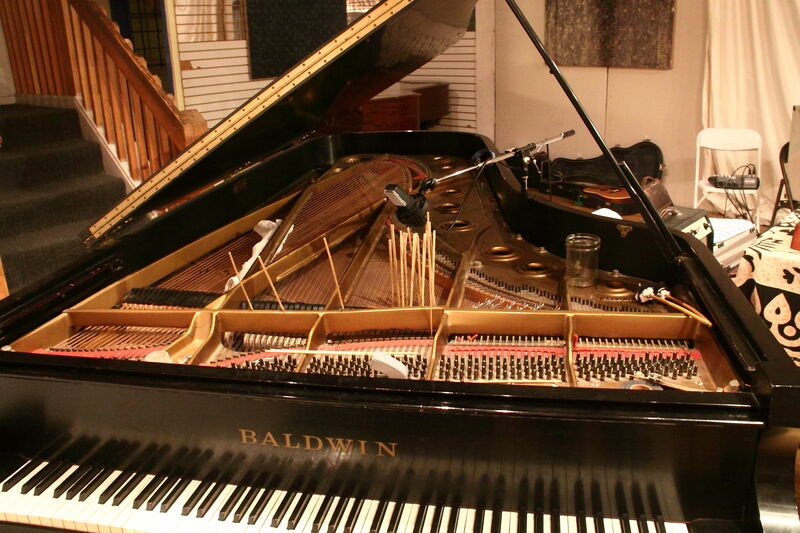 A view of the inside of the piano showing Lewandowski’s alterations. It is easy to miss the nondescript storefront on University Avenue where this performance took place. And the promotion of this concert appeared to be mostly through Facebook and the Bay Area improvisers web site which resulted in a small but appreciative audience interested in hearing the work of Annie Lewandowski, now a music lecturer at Cornell. She is a graduate of Mills College. 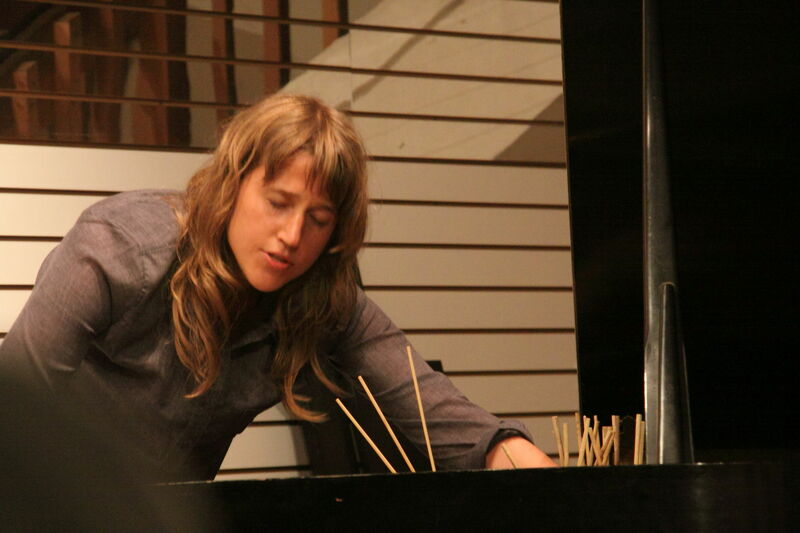 She has a varied resume ranging from classical piano to progressive rock bands and she presented tonight her work with extended piano techniques much like those of John Cage but with some distinctly personal twists extending Cage’s methods further. Ms. Lewandowski was hosted by Theresa Wong (also a Mills graduate), bay area composer, cellist and singer who organized the event and Luciano Chessa, San Francisco Conservatory professor, composer, musicologist, historian and performer and producer who played a couple of different roles in this evening. The first performance was introduced by Ms. Wong who informed us that Luciano Chessa had been kept in isolation for the last hour while the preparations were done for his performance. The piece being performed was Joan LaBarbara’s ‘Hear What I Feel’ from 1974. It consists of a table upon which there are several plates each containing some object or substance. 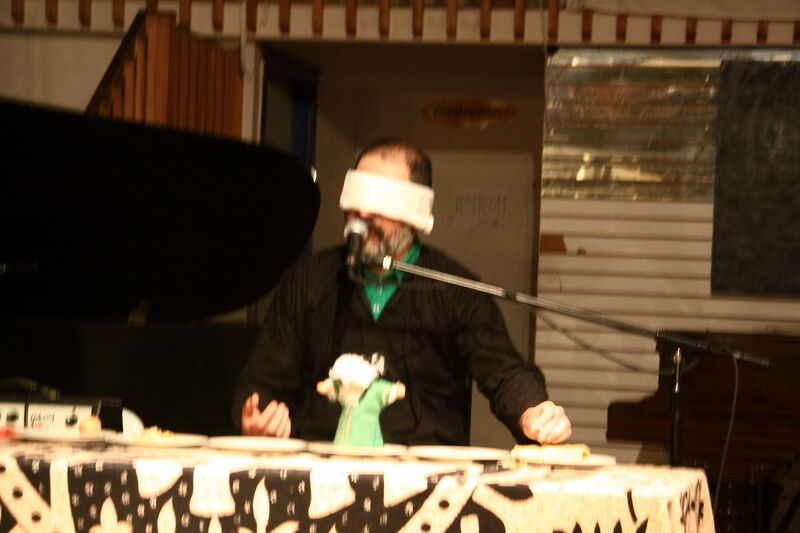 The performer, who is blindfolded, is seated at the table and the performance consists of the performers reactions to the substances and/or objects he examines with his hands alone. It is performance art that would be perfectly at home with other Dada and Fluxus-like scores. Wong led Chessa carefully from the back of the performance space to the table containing six plates. After seating him she positioned the microphone carefully in front of him. Chessa spent several minutes with each object examining three predominantly with his left hand and three with his right. All the while during his tactile adventure he vocalized a variety of sounds evoking (presumably) his emotional response to each object or creating an audio analog for them. As with all such scores the result leaves a wide range of possibilities to the performer. And this performance was suitably humorous and engaging. Following his examination of the last of the objects Chessa removed the blindfold and reacted to each of the objects (without vocalizing) as he examined them visually. There was an effective combination of (mockingly?) serious concentration and idiosyncratic responses that left the audience genially amused and entertained. Annie Lewandowski playing in the piano, on the keyboard and singing. 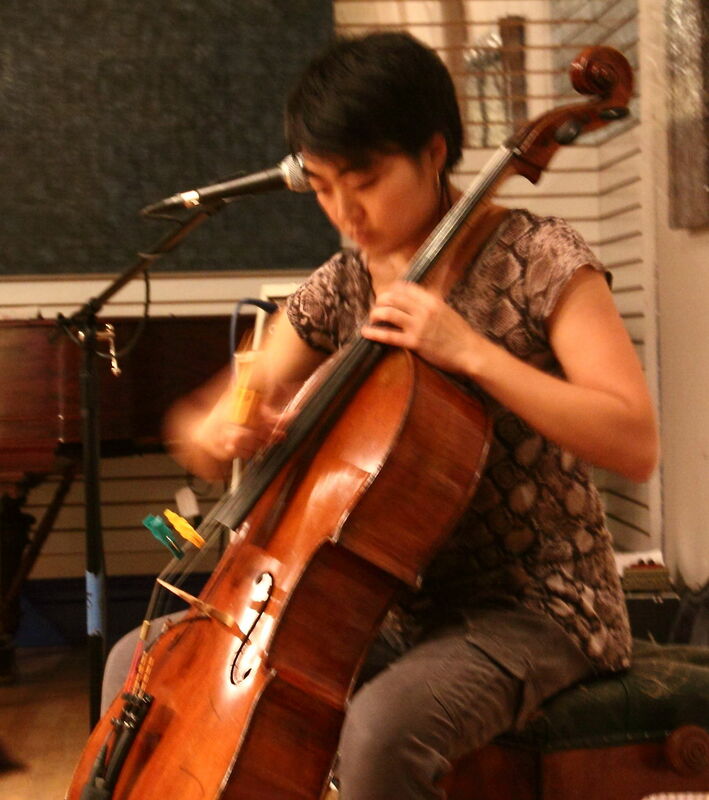 Theresa Wong playing her carefully altered and electronically enhanced cello and singing. This was followed by a duet between Lewandowski and Wong. 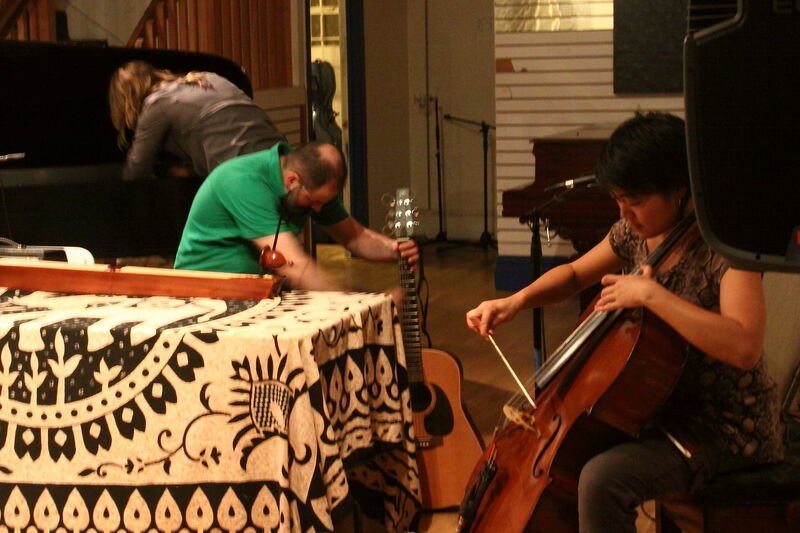 Both performers utilized various ways of altering the sounds of their instruments by adding objects to the strings or by exciting the strings with objects. Wong also made use of a foot pedal controlling some electronics. Lewandowski’s piano was miked and amplified somewhat. The improvisation was started by Lewandowski with some percussive like sounds elicited at the keyboard. Wong responded sparely at first and the two seemed to trade ideas which became richer as the performance went on. Again the serious concentration was present as the performers carefully heard and responded to each others’ music making. While satisfying it was a sort of introduction or first taste of what was to come in the second half. A brief intermission saw the performers mingling with audience members, many of whom were acquaintances and other musicians. What concluded this unusual program was a trio for all three performers. Lewandowski with her prepared piano, Wong with her altered cello, Chessa with his signature Vietnamese Dan Bau and guitar. All three also sang. The performance started sparely as each introduced suggestions or themes for the improvisation and reacted to them. Lewandowski gave a much fuller exposition of the possibilities of her instrument playing the keyboard, inside and all around the piano as well as singing. Wong also seemed to use a wider amount of sound possibilities in her playing. 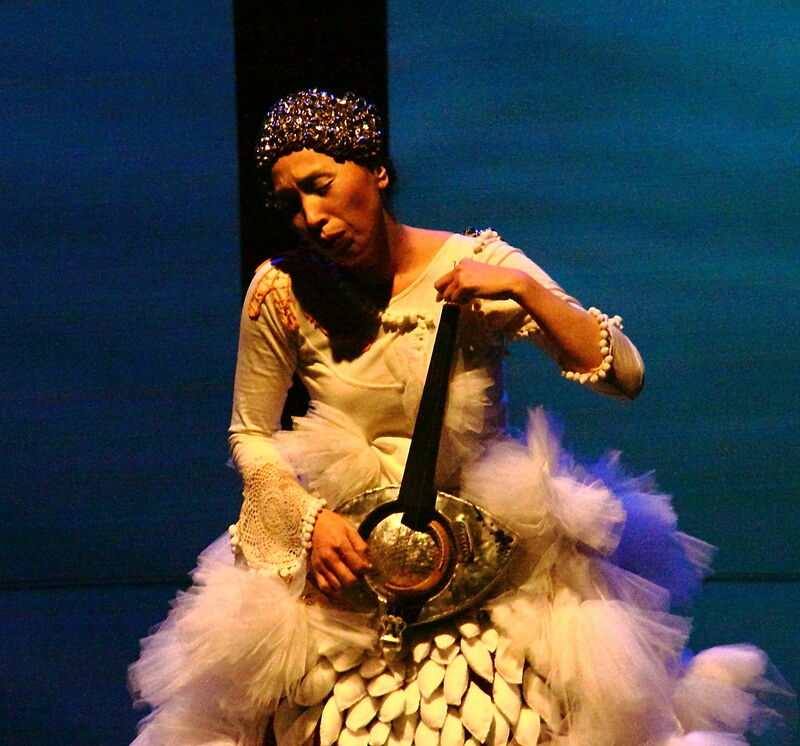 Chessa played the traditional Vietnamese folk instrument in all but traditional ways using devices to excite the strings and focusing on tuning and even some percussive possibilities. At one point he left the table where he was performing to pick up an acoustic guitar. After picking a few notes he walked to the back of the stage area and ascended a stair case leading to a sort of balcony that surrounded the performance space. It was at this point that he began softly singing what sounded like an Italian folk tune as he played the guitar in a most traditional manner. 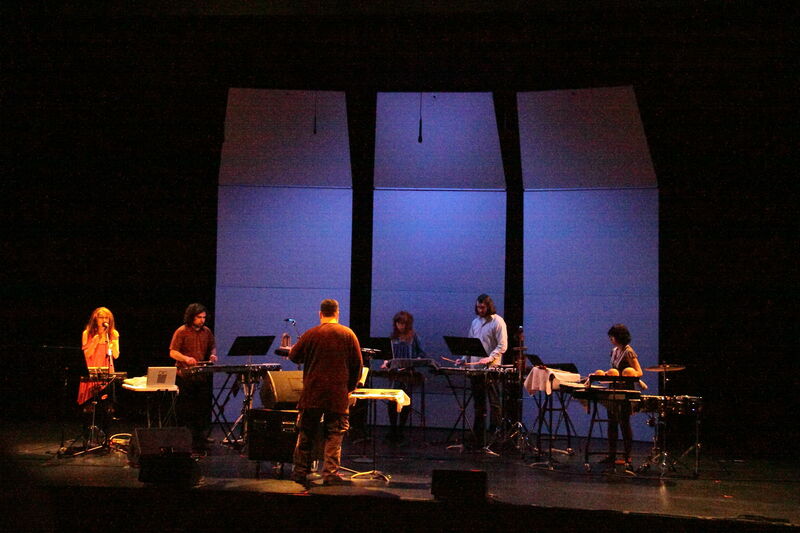 This gave a collage effect to the performance juxtaposing the most traditional kind of music making with the extended and experimental sounds. Chessa remained on the balcony for a bit, then descended the staircase again and returned to the more unusual playing methods at first on the guitar and then back at the table on the Dan Bau. Following this Lewandowski began vocalizing a melody with sparse accompaniment that would have been perfectly at home in a scene from ‘Eraserhead’ at times. She was echoed by Wong’s extended vocal techniques at first and then Lewandowski and Wong began singing a more traditional sounding melody with beautiful harmonizations interpolating this singing at different points while still traversing their freely improvised instrumental playing supported by Chessa on the Dan Bau. This made for a rather tranquil mood as they ended the second half of the concert. The audience was appreciative. And this writer was pleased to have found a gem of a concert experience by young, serious (but good-humored) and accomplished musicians in the eclectic world of the east bay. Avant Cake is an occasional series of house concerts hosted and frequently featuring Amy X Neuberg, musician, singer, poet. She is a well recognized figure in the bay area music scene. Today’s concert featured Ms. Neuberg, Guillermo Galindo and Paul Dresher. The performance was preceded and followed by a casual reception featuring various snacks, drinks and, of course, cake. Following the initial reception the attendees went down to Neuberg’s basement studio. The room, filled with electronic instruments, mixing boards and computers as well as posters of previous performances was set up with chairs for the audience, a quadrophonic sound system and video projection equipment. First up Ms. Neuberg did an improvisation utilizing some new software. Her work is a unique combination of a beautiful well trained voice, extended vocal techniques, poetry (driven in part by her study of linguistics) and electronic looping which allows her to create soundscapes and accompaniments to her lyrics and well honed theatrics which connected well with her clearly appreciative and knowledgeable audience. This performance was a sort of introduction to a developing larger collaborative project between some nine composers including today’s performers, Lisa Bielawa, bay area favorites Pamela Z and Carla Kihlstedt as well as Conrad Cummings, one of Neuberg’s teachers. The project is to involve both music and images. And this afternoon’s event is a kickoff to the fundraising bolstered by a matching grant from the bay area arts council. 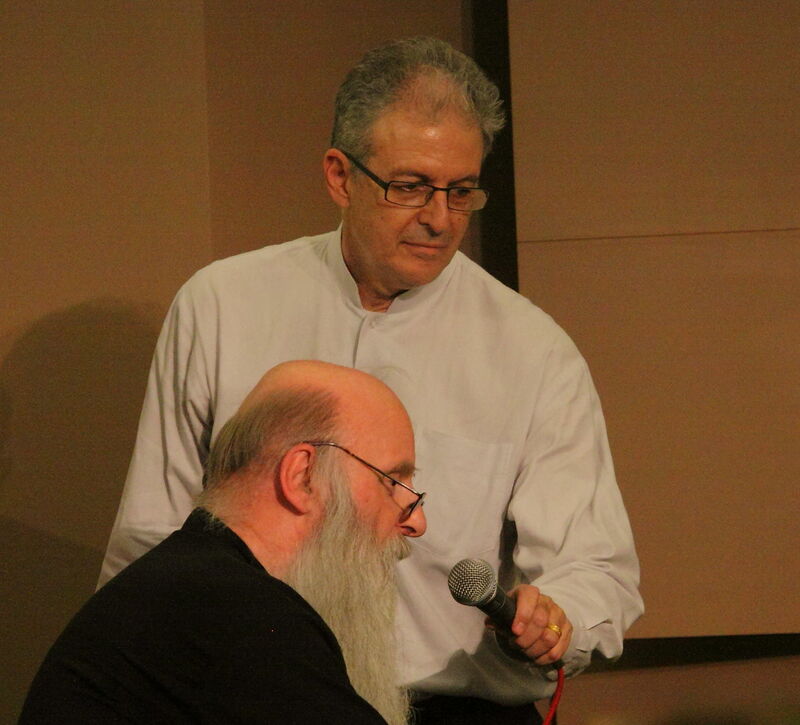 Following the improvisation was another of Neuberg’s songs and the she introduced Guillermo Galindo, a composer, sound artist and visual artist who teaches at the California College of the Arts. Neuberg sang the lead character of Simone Weil in the 2001 production of Galindo’s opera “Re-creation”. After some pesky technical difficulties with the quadraphonic sound system we were treated to live visual scenes created by Galindo using what looked like a lighted microphone but was in fact a microscope whose images were projected on a screen and which interacted with an electronic score. The piece, lasting perhaps 20 minutes, involved Galindo projecting a variety of magnified images of his own body (mouth, skin, hair, clothing) and an assortment of other objects which appeared to be insect parts, carpet fibers, a dollar bill, etc. The non-linear, non-narrative flow sometimes juxtaposed images and appeared to work well with the similarly post-Cagean sound score. The performance had the feel of somewhat improvisatory performance art and was ostensibly an idea of how he planned to work on the developing collaborative work. The audience was appreciative in receiving this interesting little preview. After a small pause to set up Paul Dresher’s computer into the projection system Mr. Dresher presented two photographs. One was of a movie screen in a drive-in theater in the desert near Las Vegas and another of an indoor theater in which the only light was from an illuminated blank screen. Both were the work of prominent photographers. But the point of showing these images was to show the audience what was given as a “homework” assignment by a woman who is a volunteer teacher at the prison in San Quentin and the response to that assignment by an incarcerated man 29 years old called Michael who, serving a life sentence for an unspecified crime, has been in jail since the age of 15. In addition to that sad story was added the fact that he wrote his assignment by hand with a small pen (too small to allow it to be used as a weapon) while he served time in solitary confinement for another unspecified offense. Dresher passed out copies of the photos for the audience to see which provided a better resolution than that on screen and a copy of the actual assignment in Michael’s own hand. The assignment was to write an analysis of and reaction to the two photographs. Dresher played a recording of the young man reading his assignment. The depth and perceptiveness of Michael’s essay beautifully read by its author were simply astounding. It was a personal and intelligent analysis of the images that put this writer in the mind of the likes of the accomplished art critic Robert Hughes. The essay illuminated very insightfully the two images and was clearly the product of a sensitive, intelligent human being. The essay and the images are a starting point for Dresher’s portion of said project and, if this little segment is any indication, suggest that the finished project (planned for a possible premiere in 2014), may be formidable and beautiful. Amy Neuberg again took the stage leading a singalong of her “Avant Cake Theme Song” and a delightful rendition of one of her earlier compositions. Following that the clearly pleased and impressed audience were invited back upstairs for more snacks and socializing. All in all a truly delightful way to spend a Sunday afternoon and an auspicious beginning to a very promising project. Support for the project will shortly be accepting donations on Kickstarter (www.kickstarter.com). And this is a project very deserving of support.